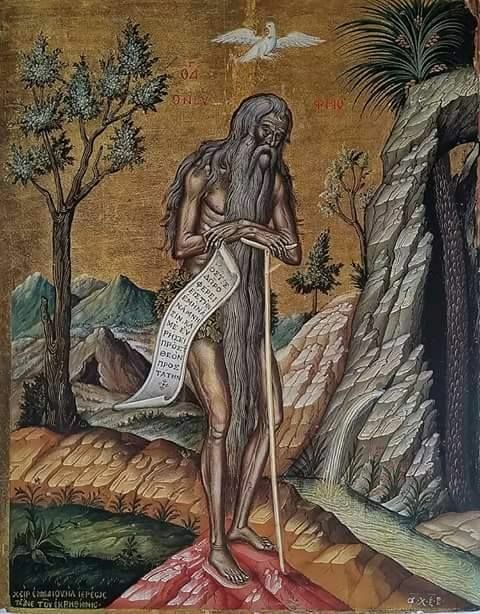 One day as I, Paphnutios, was meditating in solitude and silence, it came into my mind that I should make a visit to all the places in the desert where there were holy monks, to shed light on how they habitually lived their lives of devotion, and learn to understand the way in which they served God. So it was that I quietly began my journey, eager to make this pleasurable venture into the desert. I carried some bread and water with me to sustain me in the labor of my journey, but by the end of the fourth day it had all gone. My limbs were beginning to lose their strength for lack of sustenance. However by the light of divine grace my imminent death was staved off, and gathering up my strength I resumed my journey, carrying on for another four days, eating nothing. At the end of this I was completely exhausted, and lay prostrate on the ground as if dead. And suddenly I was gladdened by help from heaven, for I saw a man in front of me who was unbelievably glorious, splendidly terrifying, impressively beautiful, colossally tall, illustrious of appearance. I was powerfully overcome at the sight, but with untroubled countenance he came close to me, and touched first my hands and then my lips. My strength flowed back strongly into me, and I rose to my feet immediately. By God's good favor I kept on going through the desert for seventeen days, to arrive at whatsoever place the Lord wished to show me, unworthy servant though I am, until such time as I might cease from my labor. As I was wearily resting, and thinking of how I had struggled to arrive at where I was, I saw in the distance a man terrible to behold. He was covered all over in hair like a wild beast. His hair was so thick that it completely concealed the whole of his body. His only clothing was a loincloth of leaves and grasses. The very sight of him filled me with awe, whether from fear or wonder I was not quite sure. I had never before set eyes on such an extraordinary sight in human shape. I didn't know what to do, but as I valued my life I took refuge in flight, and clambered hastily up a nearby cliff face. In trembling haste I hid myself under some thick leafy plants, breathing heavily. Age and abstinence had nearly become the death of me. The man saw me on the cliff and cried out to me in a loud voice. "Get up, get up," he said. "You mustn't kneel before me. You too are a servant of God and your name is Paphnutios, beloved of the Saints." "I can see how earnestly you wish to know about the tribulations of my long life, beloved brother. Have no fear, I shall tell you everything, right from the beginning. 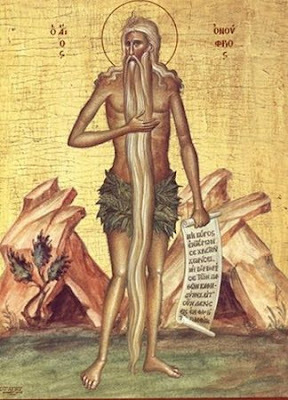 I am called Onouphrios, an unworthy sinner, and I have been living my laborious life in this desert for nearly seventy years. I have the wild beasts for company, my regular food is fruit and herbs, I lay my miserable body down to sleep in mountainsides, in caves, and in valleys. Throughout all these years I have seen no one except you, and I have not been supplied with food by any human being. 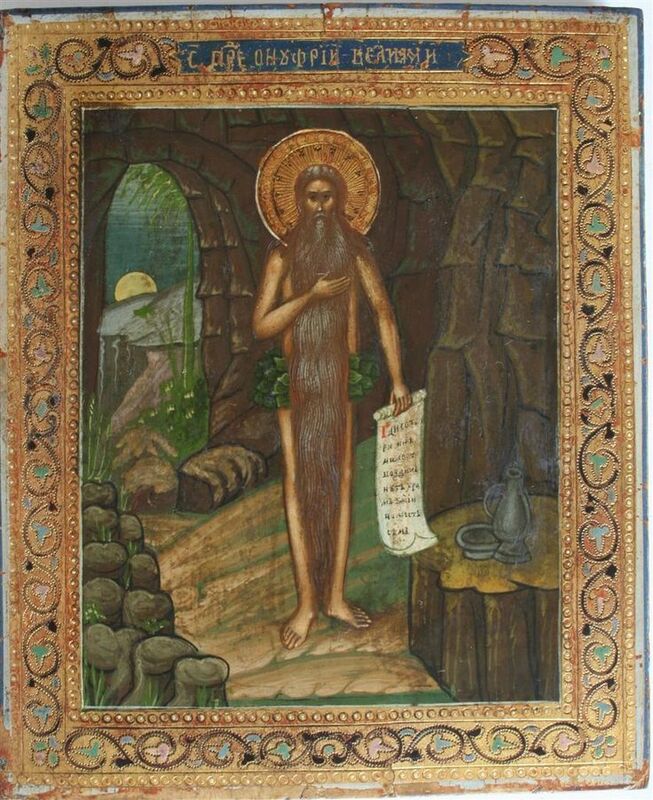 Above all I frequently heard the venerable brothers praising the life of our holy father Elias, who disciplined himself in the desert with such abstinence and prayer that the Lord found him worthy to be given exceedingly great virtues. As he was carried away in a chariot of fire, he imparted his gifts of the holy Spirit to his disciple, and in his old age he did not see death (2 Kings 2.12). Then they would go on to the example of the blessed John Baptist who shines brightly through the pages of the New Testament. Throughout a period of many years he had been called aside for a special divine purpose, disciplining his body until such time as he was counted worthy to baptize the Redeemer of the world, when he pointed up to the heavens and declared him to be the Lamb of God. As I listened to them talking of such things, I found I had questions to ask. 'My son', they replied, 'those who live without the help of any other human being are much stronger than we are. Each one of us is constantly being observed by everyone else, we all share in the celebration of the divine office, our food is ready for us at meal time, if anyone of us is ill or suffers from any other kind of human disability, the brothers are there to care for us with all kindness. We live in spacious buildings which shelter us from the summer heat and from the rain in winter. We are protected from the turbulence of wind and tempest. But the monks in the desert have no comfort except in God. If at any time they are suffering trials and tribulations, or if they begin to wage war with the devil, that ancient enemy of the human race, who is there for them? Who can help them? But when human help is lacking, divine help is always present. And if they are hungry, who will feed them? If thirsty, who will give them water where there is no food or water? 'It is beyond all doubt that desert places demand the maximum amount of labor, for the necessities of life are not readily available. The first essential for anyone deciding to live in solitude, therefore, is to be certain of standing firmly in the fear of God. They crucify their bodies in hunger and thirst, in labor and suffering. They fight manfully against the wiles of the devil, and against the fiery darts of the wicked they conquer with the sword of the spirit. That ancient enemy, the fount of all evil, strives always to bring them to ruin and enroll them in the company of the wicked, by undermining the good will with which they set out, by ensnaring their minds in thoughts of worldly pleasures, and making them weary of persevering in the work they have begun. 'But the Almighty God never abandons those who put their trust in him, for he surrounds them with the armour of his power, and the attacks of Satan have no power against them, for they are protected by divine mercy from on high. They are constantly under the protection of the Angels of God who habitually bring them everything they need. They drink water from the stony rock (Psalms 78.15), which, being interpreted, is Christ. For it is written: "The holy ones who trust in the Lord will be strong, they shall rise up with wings as eagles, they shall fly and shall not fall, they shall run and not be weary" (Isaiah 40.31). And again: "Those who thirst shall be refreshed by heavenly fountains, and green leaves shall melt in their mouths like honey" (cf. Exodus 16.31). Thus spoke the Angel, who became my companion at the beginning of my journey. We went on for about six or seven miles until we came to a rather insignificant looking cave. I went closer to see if there were anyone inside, and as is the custom of monks I humbly called out to ask a blessing. I suddenly saw a most holy man emerge, and I prostrated myself on the ground before him. But he stretched out his hands, lifted me up and offered me the kiss of peace. I went in and stayed with him for many days, eager to know what he did, wanting to find out about his solitary life. He knew what it was I wanted to know, and in words of most loving kindness gave me some wonderful advice about how to counter the snares of the devil. 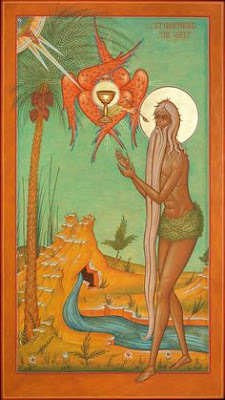 Having said this, the holy man arose and came with me, and traveled with me for four days into the inner desert. On the fifth day we came to a place in Calidiomea where there were some palm trees. And he stayed with me for a further thirty days, teaching me how to serve the teachings of God's commandments with watchful diligence. At last he commended me to God in his holy prayers, and went back to his own place. He continued to visit me once a year, and never ceased to admonish me with his godly words about how to live in simplicity and diligence. There came a time when he visited me as usual and fell down to the ground as he greeted me. He had given up his soul to the Lord and had fallen asleep. I was overcome with grief, and flung myself down, weeping floods of tears which rose up from within me. And then I took up his body and committed it to the earth of Calidiomea." "Holy Father," I said, in reply to all that the most holy Onouphrios had said to me, "I sense that you must have persevered through some rather difficult adversities in this desert in the name of Christ." "Believe me, beloved brother," the holy man replied, "I have endured such things in this desert that I have often thought I was very near death. There have been so many times in my life when hope has failed me and I have scarcely had any breath left in my body. Scorched by day in the heat and burning fire of the sun, exposed to dew and hoar frost by night, fainting from hunger and thirst - O how many such things have I suffered! I cannot tell you how many wounds and hard knocks must be suffered by anyone who is willing to die for the love of God, nor would it be right to do so. But the Lord rewards the labors of his Saints (Wisdom 10.17), for his riches are beyond telling, nor can they be diminished. Through all the manifold pains and torments that I have suffered, cold and heat, hunger and thirst, his power has strengthened me with the heavenly riches of the company of Angels. By spurning food for the body I have been found worthy to receive the bread of heaven. My holy Angel has daily brought me bread, and water in due measure, to refresh my body lest it faint, that I might continue in the praise of God. The palm trees have this property that the dates ripen twelve times a year. I picked them daily and ate them together with green herbs, and they were in my mouth as the honey and the honeycomb. In the Gospel it is written, 'Man shall not live by bread alone but by every word that proceeds out of the mouth of God' (Matthew 4.4). Brother Paphnutios, if you wish to fulfill the will of God, everything necessary is ready for you. For the Truth himself counsels you, 'Take no thought for what you shall eat, or what you shall drink, or what you shall wear, for your heavenly Father knows that you have need of all these things. Wherefore seek first the kingdom of God and all these things shall be added unto you'" (Matthew 6.31-33). I was lost in admiration for what this blessed man Onouphrios was telling me about his deeds and labors. 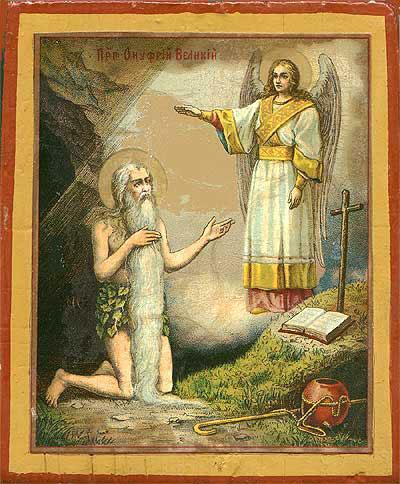 As I listened to all these things that the venerable Onouphrios was telling me at the top of his little mountain where he met me, I was filled with such great joy that every hardship which I had suffered on my journey was banished into oblivion. "Father," I said, "I count myself to be numbered among the blessed for having been found worthy to meet you, and to hear of all your wonderful works. What you have told me is so beautiful, so honey-sweet, and my heart is so pierced to the core, that I can truly say with the Psalmist, 'How sweet are your words to my taste, sweeter than honey and the honeycomb in my mouth'" (Psalms 119.103). 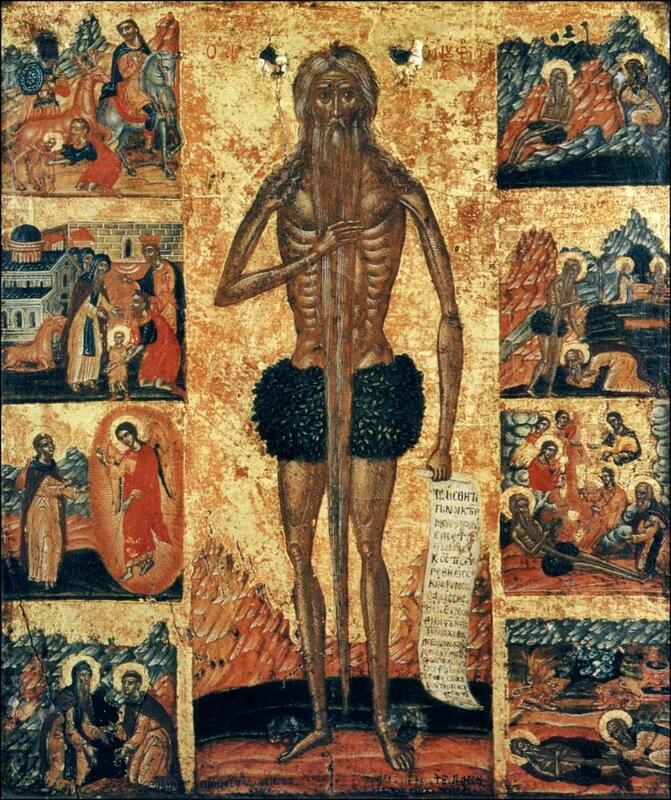 "Don't be over alarmed, brother Paphnutios," he said, "but I think that the omnipotent God has directed your footsteps into this desert that you may give me an honorable burial, and commit my body to the earth. For this is the hour when my soul is to be released from its earthly chains and carried away to its creator in the kingdom of heaven. I know what you intend to do, my beloved brother, so when you go back to Egypt, tell all your brothers and all the worshipers of Christ about me. I have made a request to God which he has granted me: If anyone offers the holy sacrifice for the love of my name in the sight of our Lord Jesus Christ and gives himself wholly to the praise of God, he will be able to resist all the temptations of the devil and will be freed from all the chains of human wickedness, and will be able to enjoy the inheritance of the kingdom of heaven with the holy Angels forever. And anyone who is not authorized to make the offering or who cannot afford to pay for it, let him give an alms to the poor in the name of the Lord and in his honor, and I will pray for him in the sight of God that he may be found worthy to enjoy the life above in the heavenly realms. If there is anyone who cannot offer the sacrifice or give alms, let him offer sweet smelling incense to the Lord our God for love of me, and I will ask that he enjoy perpetual bliss." "Paphnutios," he replied, "do not worry. The Lord will grant that your desire will stand firm. Stand in faith, act manfully (1 Corinthians 16.13), keep your eyes and your mind always on God, keep the commandments, do not be weary in well-doing, grasp hold of eternal life. May the Angels of God protect you and keep you from every working of wickedness, that you may be found pure and spotless before God in the day of judgment." 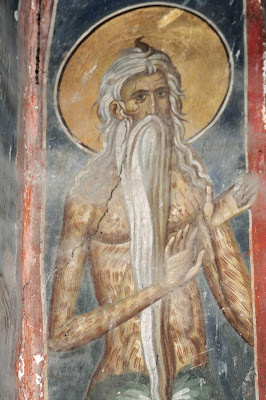 And I suddenly heard the voice of a multitude of Angels praising God as the most holy soul of Saint Onouphrios departed, and that angelic song resounded with ineffable joy among all the stars of the universe, while the heavenly armies carried the soul of this distinguished warrior up to heaven. I wept profusely, I groaned inwardly, rivers of tears flowed down, I beat my breast over and over again. I complained in sadness that hardly had I met him than I was no longer able to enjoy his company. I tore my tunic in half, keeping half to cover my body and using half in which to wrap his blessed body. I buried him in the natural tomb of a cave in the solid rock. I was alone, I wept afresh. Still weeping, I made as if to enter the cave where he had lived, but as I stood in front of it, it collapsed with a mighty roar, and the palm trees were torn up by the roots and lay prostrate. And then I knew that it was not God's will that I, Paphnutios, should live in that place. I returned to Egypt, and there I told the Church all that I had seen and heard. 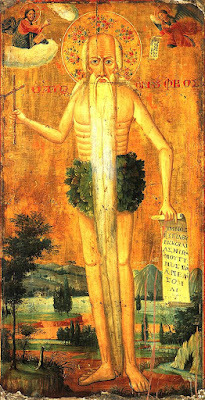 The holy Onouphrios died on the eleventh day of June, that is the third day before the Ides. His blessings are with us to this present day to the praise and glory of our Lord Jesus Christ, to whom be all honor and power unto the ages of ages. Amen.